Thunderbirds Pinball machine is a highly-stylish pinball game machine, is expected to be released at the end of March in 2018 by Homepin, will have a conventional dot matrix display and cabinet design, although the control system will be a custom design using embedded microcontrollers, based on popular UK science-fiction television series, featuring authentic character voices and original music, with plug and play with components such as shaker motors as standard, has been enjoyed by children and adults across the generations. 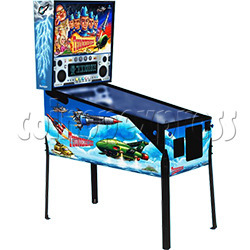 Thunderbirds Pinball game cabinet gives the game an unique look and feel, the playfield includes Tracy Island with its retracting swimming pool and palm trees; just like in the classic 1960s thunderbirds TV series. Creating a retro look and feel combined with some modern twists. With the ultimate aim of defeating International Rescues Nemisis The Hood, the multi-game play of this machine makes it suitable for both novice and experienced players alike. Notes: - We offer 12 months warranty on the game board, LCD monitor, shaker motor, and 30 days for other items. - As the goods will start manufacturing end of Feb, and machines will ship end of March.